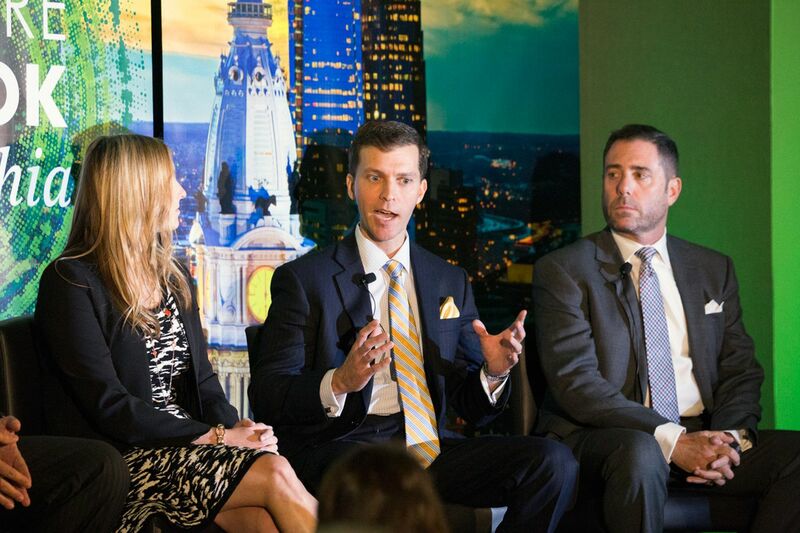 Steven H. Gartner (right), CBRE's managing director for retail services, listens as Vince Ranalli speaks at CBRE's annual forecast at the Logan Hotel in Philadelphia on Wednesday, Oct. 26, 2016. Center City retail rents could moderate a little in 2017 from their peak this year, but Philadelphia will remain a hot market compared with other U.S. cities. That was the consensus at an annual forecast by commercial real estate firm CBRE Inc. on Wednesday, which confirmed data contained in a report the firm released this week on the city's urban retail landscape. "There is a tremendous feeling of energy and vitality," Robert Walters, executive managing director for CBRE, the region's largest commercial real estate firm, said in his opening remarks at the Logan Hotel. "From Center City, to Market East, to University City, there is a lot going on that includes restaurants, retail, office redevelopment. It's really an exciting time." The average "prime" retail rent in the city grew 87.5 percent over the last five years; only one other North American city - Miami - saw rents grow faster. Sales of urban retail buildings during the year ending the second quarter of 2016 were 18 percent higher than the former peak in 2008. Ground-level rents on Walnut Street between Broad and 19th Streets reached a record of $162 per square foot in the winter of 2015, although the rate moderated to $159.70 per square foot in June of this year. Steven H. Gartner, CBRE's managing director for retail services, said that viable retailers now must pursue both an e-commerce strategy along with a physical store presence, and cited newcomers to Walnut Street including Athleta, Bonobos, and Warby Parker (which will open at the end of the year). All three began as purely online players but are now building brick-and-mortar stores. As far as any anticipated slowdown in space demand, he said: "Just because rents don't go up every year does not mean the market isn't vibrant and healthy. In some parts of town, especially outside of our traditional shopping areas, demand has gone from very light to highly so." Other retail experts are seeing the same trends. Lauren Gilchrist, vice president and director of research at the Philadelphia office of Jones Lang LaSalle, predicts a momentum shift. "Ongoing construction at National Real Estate Development's East Market project and the PREIT/Macerich's [renovated] Gallery Mall will deliver 1.8 million square feet of brand-new retail to this historically under-retailed submarket," she said. "With spaces on Chestnut and Walnut Streets averaging less than 5,000 square feet - some significantly smaller than that - it can be difficult for retailers whose concepts require a midsize space to find a suitable option along our historic retail corridors." Andi Pesacov, senior director of the retail division at Cushman & Wakefield, who recently brokered the deal to bring A.C. Moore to 13th and Chestnut Streets at the Land Title Building, agrees. "This is a billboard, flagship location for a retailer," Pesacov said. "It's truly the middle of the city. Retail trends now are either large-format spaces, or boutique-size space of 1,500 square feet or less, so the demand leads to areas that provide the footprint retailers need." "Old City and Washington West are two very hot retail areas in the city right now," she said. "Old City is just pure charm and style, all in the most comfortable atmosphere in the city. Amazing boutiques, high-end furniture showrooms, and art galleries are the mainstay. Washington West is growing its restaurant presence as you have prime retail space previously used for office space now being transformed. Beautiful historic office buildings lend to restaurants on the first floor with an in-house clientele above." Center City broker Chris Shenian negotiated the deal to bring Maine-based high-end furniture maker Thos. Moser to 1605 Walnut St. The store will open Nov. 10, next to an Apple store. "There are still available spaces on Walnut Street in the 3,000-square-foot range, but we will only see strong national retailers fit based on the asking rent," Shenian said. "I can't foresee how restaurants can make these numbers work on Walnut moving forward." Others, such as Jacob Cooper, managing director at MSC Retail, are bullish on Center City. "I don't see demand falling off," Cooper said. "I am seeing occupancy costs getting a bit high for some retailers and restaurants, so we will see some leveling off, or in some cases, declines in asking prices. "This is an amazing place to live, work, dine, and play," he said. "The underlying economics for both tenants and landlords just need to remain in sync."